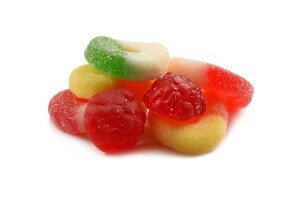 The bright white and red coloring of cherry gummy rings gives them a festive, refreshing appearance. 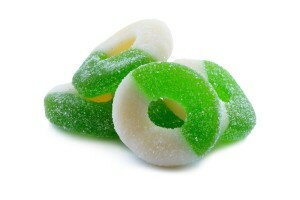 The sprinkling of sugar on the rings make them an irresistible treat when your sweet tooth needs satisfying. 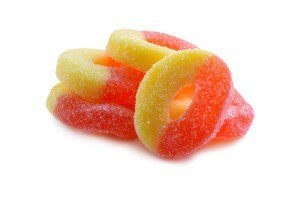 Your palate will appreciate that these rings have a dual personality. Mingled in with that sweetness is an exciting, tart, tangy burst of cherry flavor. Corn Syrup, Sugar, Gelatin, Citric Acid, Sorbitol, Natural and Artificial Flavors, Lactic Acid, Titanium Dioxide, FD&C Red #40. These are so great i will be ordering more. very delicious. will be buying more of these.